please starting rounding the draw times up or i might have to jump out a window. Hey Chris! These are super awesome! I can't believe you didn't even have an under drawing (it seems), just straight up ink!!! Thanks for sharing sir! Gee- I quickly sketched in blue before inking. I omitted the blue for the scans. Wow wow wow wow wow. Straight up, these are incredible. yeehaw!!! what a great treat from you. Please feel free to post more stuff like this. So nice. 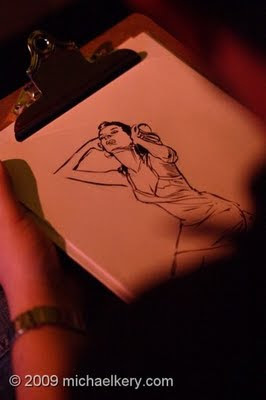 Good to see Sydney in the Dr.Sketchy's scene too. How often do they have em up there? If you're ever in Melbourne there's one every month, hope you come down, love to see your craft first hand!! whenever you're in Melbourne that is! Nori- They do them every second Tuesday here in Sydney. The one I went to last Tuesday was the last for the year, but they resume again in Feb. I imagine Melbourne would put on a great show. 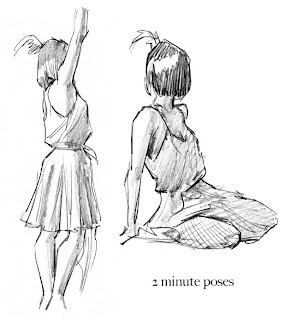 Saw your Dr. Sketchy drawings on your blog. Great stuff. Super awesome Chris.... beautiful sketches!!!! These are fairly amazing for the allotted time and exceedingly accomplished for any amount time. hey chris, id love to join ya next time youre there. great drawings! rodrigoart- Would be great to see you there. After looking at the phenomenal work on your blog, I imagine you could teach me a thing or two. Great work! Thanks for the brushes in the previous post as well, I just got all of 'em! Such good work, Chris! Man, the jealousy factor is so HUGE!!! :) Thank you for sharing your talent--tis a pleasure to see. When I'm old and retired, I vow to go back to drawing school. Wonderful drawings! Looking forward to more of them. Awesome sketches! Thanks for posting, Chris! Great stuff as usual! Looks like you were working kinda small - just regular size office paper, eh? So you did a quick blue pencil sketch - but then what did you use to ink? One of them newfangled brush pens (you were certainly not dipping a brush not an inkwell while imbibing at the pub!)? CCG- Yep just A4 copy paper, it's a good size for scanning. I used a Pentel brushpen, they're very close to using a real brush, fine lines but also thick drybrush strokes as well. These are super solid. Hope that barmaid was happy! Really great stuff. I've been wanting to go to this for a while. remind me not to sit next to you when I do! Jelter- Fantastic work on your blog! Best wishes in this 2010!!!! As ever, Chris, you draw like a master. Qué buenos todos los trabajos!!! bravo!!! I'm a bit slow off the mark adding new work to the blog this year. I'll have some new stuff to post soon. Hope everyone has a great 2010. Man gonna get me one of those brush pens, gives a great result. Really looking forward to when all the life drawing around Sydney begins again. I thought you went straight ink also, and was thinking man that's keen. Cam- Yeah, those pens are definitely worth hunting around for. Dr. Sketchy starts resumes on the 9th Feb if you and Gee are interested in attending. 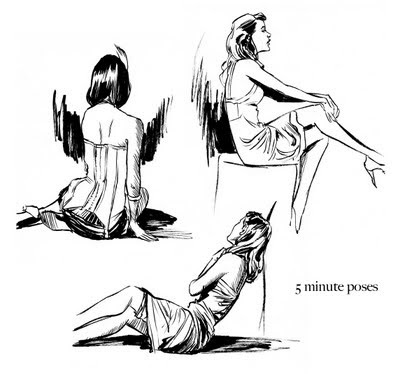 Really like these drawings. I haven't done much sketching recently and seeing this makes me want to do more of this kind of thing. What a fun way to challenge yourself. Do you do this regularly? Thanks GG! I do this every month or so.